Tim's middle names should be has super because there just isn't really any other explanation as to how someone can write the way he does. This is nowhere more evident than in his Fault Lines Trilogy and in particular the finale of the story — Earthquake Weather. The book is set within the San Fransico area of the 1990's and describes a world that is our own and yet has it's roots in magic. This isn't the shiny, glitzy magic of elves and fairies or the highly elaborate magic of wizards and witches. This is the magic of the Earth itself and the creatures both natural and super that dwell within. Magic within Earthquake Weather is matter-of-fact and feels an entirely natural thing that just belongs. The book brings together the protagonists and story threads of the award winning books Last Call — featuring Scott Crane and the Fisher King and Expiration Date — with the ghost of Thomas Edison and the young Koot (Kootie) Hoomie Parganas. 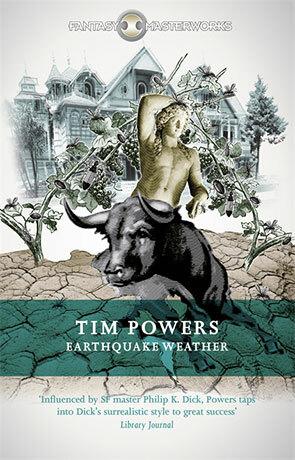 Earthquake Weather was originally released in 1997 and was nominated for the BSFA and Bram Stoker awards. It won the prestigious Locus award in 1998 for best novel and is now part of Gollancz Fantasy Masterworks collection. Earthquake Weather begins with the news that the Fisher King has been assasinated by a possessed Janis Cordelia Plumtree. It seems likely that Kootie is next in line to become the new King, that is unless Archimedes Mavranos — the Fisher King's right hand man, can revive the old King. Such an act is highly dangerous and likely result in the deaths of Archimedes, Kootie, Kooties adopted parents and anyone else trying to help. I love the atmosphere of Tim Powers novels, dark and forboding with a strong dose of reality despite the magic and supernatural powers that feature. The way the author describes such magic makes it seem entirely plausible and suspends the sense of disbelief in a way few authors are capable of. I'm reminded of Neil Gaiman and Chuck Wendig in the grungy urban backdrop and flawed, sometimes tragic characters that colour the story. The book starts off at a fast pace, moving the story forward consistently and it doesn't falter once. Old mythology is brought into California of the 1990's and this blend works well. It works even better with the flawed, unusual characters. The lines between protagonist and antagonist are blurred in a clever manner with the introduction of my favourite character Janis. Janis shares her body with a number of different people, some nice, others not so nice including one who seems quite capable of murder. This really changes the dynamics of the story. One of the personalities inhabiting the body of Janis killed the Fisher King and she tries to make amends by helping Kootie, assisted by Sid Cochran who's attempts to maintain a relationship with Janis provide an effective vehicle to explore Multiple Personality Disorder (MPD) which is now often referred to as Dissociative identity disorder (DID). The Psychiatrist who "treats" Janis (and Sid) at the start of the book is the main bad guy and he is one seriously messed-up individual indeed. He makes a convincing antagonist and it's hard not to feel creeped out when the story turns to his exploits. The writing is sublime, the author weaves such a convincing spell overflowing with beautiful verse that it's impossible to resist — writing of this calibre is a magic all it's own. It's a rewarding tale with an absolute corker of an ending but I would recommend that you read the first two novels in the series first as there is little hand-holding for those who haven't. Earthquake Weather is rich, rewarding fiction from the pen of a true storyteller. Written on 21st December 2015 by Ant.